The City Council wanted the funds to be used for improving streets, repairing the river wall by the Ames Mill dam, and building a public parking lot as well as other downtown improvements to be planned later. The limited supply of parking downtown and its threat to economic vitality had been documented since the 1978 University of Minnesota Northfield River Corridor Plan and was subsequently corroborated by the 2001 Walker Parking Study. Realizing that the sunset of the TIF District was approaching, a group of City Councilors and the City Administrator formed the Downtown Improvement Group in 2003, a task force charged with prioritizing projects for the District’s proceeds. Their projects included a drinking fountain in Bridge Square and crosswalk pavers at pedestrian connections around Bridge Square and the western approach to the Pedestrian Bridge over the Cannon River. The Mayor’s Streetscape Task Force was created in 2005 in an effort to increase private citizen input from downtown stakeholders. For the next two years, the group discussed community priorities and considered potential projects, including such concepts as visitor way-finding, pedestrian safety, and public space enhancements. 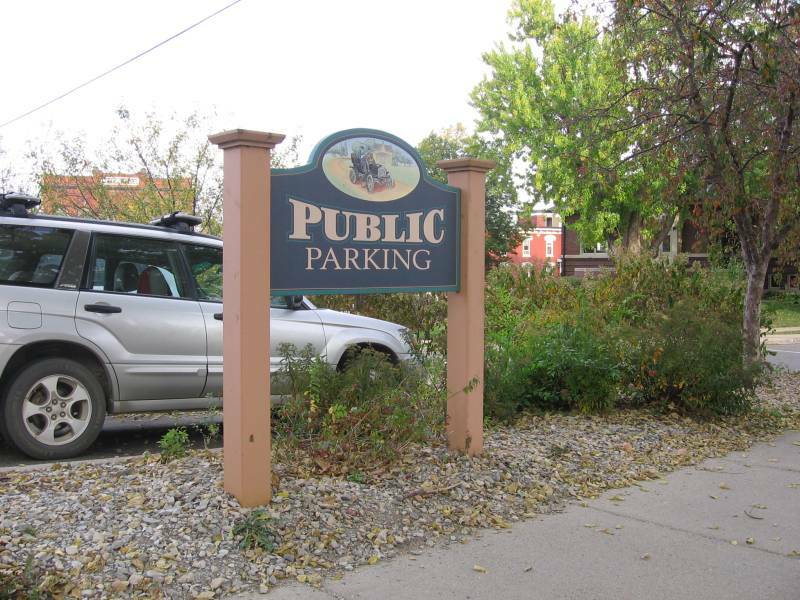 As was the case back in 1986 when the District was established, creating additional parking was a priority for the downtown stakeholders in 2005. In 2008 and 2009 Streetscape Funds were used to finance City infrastructure projects, such as the 5th Street reconstruction, the 4th Street reconstruction, and the Ames Mill Dam retaining wall, as well as Task Force-supported projects such as the Riverside Bike Trail Extension and the Sesquicentennial Legacy Plaza. By the end of 2010, $2.3 million of the approximately $4.6 million in projected revenues had been spent. Many Streetscape Task Force members, although supportive of the projects implemented, expressed concerns that some priority projects, especially the expansion of downtown parking, were not being considered. During 2010 a new City Administrator assisted the Task Force in converting these priority projects, including parking, into specific recommendations. The Task Force presented their recommended projects to the City Council in the form of a matrix that related each project to the 2006 Downtown Framework Plan, including brief descriptions and estimated costs, and totaling an amount that was within the remaining projected revenues for the TIF District. The City Council reacted with considerable sticker-shock at the budgeted amount for the Task Force’s top-ranked priority: increasing the supply of downtown parking. In addition, the members of the 2010 City Council expressed interest in spending some of the money outside of downtown. Recently, when downtown stakeholders became aware that their top-priority was set aside, they reacted with alarm. They gathered dozens of signatures from downtown building and business owners urging the City Council to support the Task Force’s recommended parking project on Washington Street between 3rd St. and 4th St.